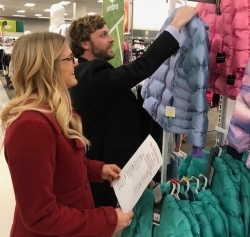 Raleigh, NC, January 10, 2019 --(PR.com)-- Throughout 2018, Acquire lead the way in their industry not only for their marketing game and brand mastery, but also for their amount of charity involvement. The promotional marketing firm, located in the North Hills district of Raleigh, did not seem to shy away from any one philanthropy in particular, rather, they teamed up with a variety of local non-profit organizations over the past twelve months. To wrap up the year in December, Acquire adopted a family through The Salvation Army’s Angel Tree program. After participating in a local food drive during the Thanksgiving holiday, Acquire continued their charitable efforts by attending Raleigh’s 25th Annual Jingle Ball Gala in partnership with The Salvation Army of Wake County. The Gala is held each year to collect Christmas toy donations for less fortunate children in the local community. Being a part of the Christmas toy drive inspired the Acquire team to get involved with The Salvation Army once again to provide more than just Christmas toys to the children in need. This time, they chose to donate clothing by adopting a family of five children from the Angel Tree program. Since 1979, Angel Tree has been part of The Salvation Army’s Christmas Cheer Program and has provided ways for local citizens to be directly involved within their community by allowing them to give to the less fortunate on a more personal level. Families who apply for Christmas assistance through The Salvation Army are placed on Angel Tree’s adoption list to receive Christmas gifts from a community member who adopts the child. Through adoptions and donations, the Angel Tree program is able to provide new clothing and toys to thousands of underprivileged children for Christmas. Through a variety of community involvement, Acquire was able to provide new clothing, Christmas toys, and hundreds of meals to less fortunate citizens of the Raleigh Triangle in 2018. The Acquire team plans to continue expanding their philanthropic efforts and look forward to discovering and working with even more charitable organizations in 2019. For more information about Angel Tree and The Salvation Army, visit www.salvationarmycarolinas.org/wakecounty/get-involved/christmas-opportunities/angel-tree-opportunities. To learn more about Acquire and their philanthropic efforts, go to www.acquireraleigh.com.